College News: Thank You Teachers! Dr Elizabeth Lee, Senior Executive Director of Sunway Education Group and Sunway University thanked Sunway’s lecturers and teachers for their contribution, dedication and passion. 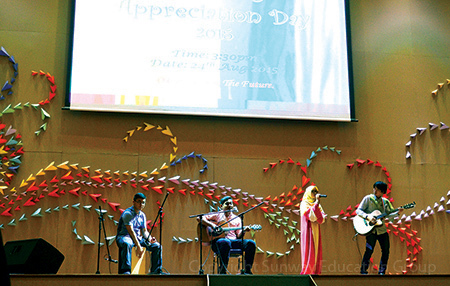 “Here at Sunway, we don’t just educate. We mould lives, we transform students into individuals who can think and contribute positively to society. We hope to build relationships so that when our students leave here they will carry more than just textbook knowledge. We want to create a lasting impression, a positive influence in our young charges’ lives. 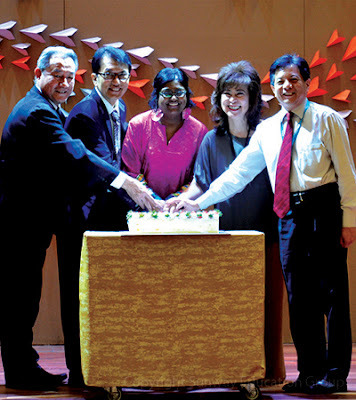 I hope you share this with me, as we can only do this through you, our teachers and lecturers,” said Dr Lee. Supporting the day were Dr Lee Weng Keng, CEO, Education and Healthcare Division of Sunway Group; Professor Pua Eng Chong, Deputy Vice-Chancellor (Academic), Sunway University; Teo Ee Sing, Executive Director of Sunway College; Betty Lai, Director of Human Resources and Facilities; senior management of Sunway University and Sunway Education Group; and members of Sunway Academic Staff Association (SASA). SASA is deemed as a bridge between the management and academic employees of Sunway Education Group, formed as an avenue for academic staff to voice out grievances and provide suggestions for improvements. 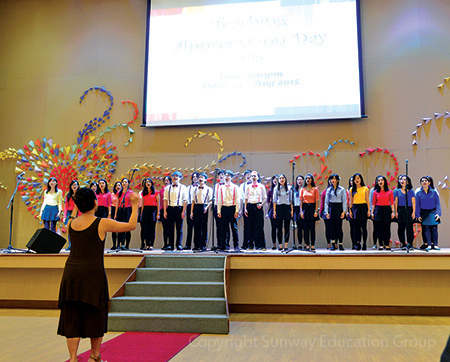 SASA worked together with Department of Art and Design and Human Resources Department for the creative backdrop of the celebration – a big rainbow heart made of colour paper airplanes which the members pasted one by one. Jennifer Rathabai, President of SASA was one of the 46 recipients. “Such appreciation events motivate us. I thank the management for acknowledging our efforts,” said the passionate Senior Teaching Fellow from Intensive English Programme of the Faculty of Arts who has been serving the university for over 6 years. She attributed the success of the event to the voluntary efforts from various departments and she called upon her fellow colleagues to support and join SASA. 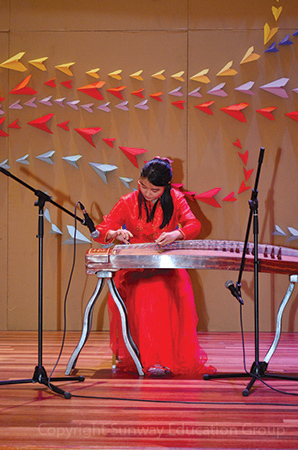 Chan Wy Yee, a young lecturer who has joined the Foundation in Arts about 2 years, was in utter surprise in receiving the award. “I thought it was a prank call when I was notified! But I am really happy to receive this as it helps boost my confidence in my career,” said Chan, adding that her teaching profession has been rewarding as she sees her students grow and graduate. The audience was treated to various performances, including a singing of “The Best of You in Me” by the Sunway University Choir, a singing performance of the well-known malay song “Kau Ilhamku” (You’re My Inspiration) by a group of four international students from Sunway College’s Australian University Programme, and a Gu Zheng performance of “Battling Against Typhoon” by AUSMAT student Shireen.